We deal with the sale of Renault Trucks genuine spare parts and with other stuff related to the freight transport business. 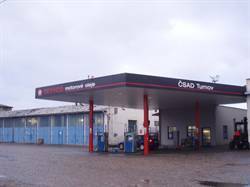 We run a renovated petrol station in the company premises. We offer the contractual customers an automated dispenser for a fuel outgoing 24/7 all the year round. Tires: Barum, Continental, Michelin, Firestone, Bridgestone, Dunlop etc. Service fluids: petroleum, diluents, benzine, toluene etc.